The Day of the Dead (Spanish: Día de Muertos) is a Mexican holiday celebrated throughout Mexico, in particular the Central and South regions, and by people of Mexican heritage elsewhere. The multi-day holiday involves family and friends gathering to pray for and remember friends and family members who have died, and helping support their spiritual journey. 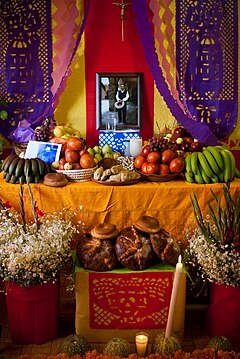 In Mexican culture, death is viewed as a natural part of the human cycle. Mexicans view it not as a day of sadness but as a day of celebration because their loved ones awake and celebrate with them. In 2008, the tradition was inscribed in the Representative List of the Intangible Cultural Heritage of Humanity by UNESCO. 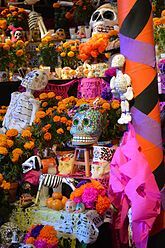 The Mexican Day of the Dead celebration is similar to other societies' observances of a time to honor the dead. The Spanish tradition known as 'All Saints Day' celebrates in similar ways, for instance they celebrate with festivals and parades, as well as gatherings of families at cemeteries to pray for their deceased loved ones at the end of the day. Posada created what might be his most famous print, he called the print La Calavera Catrina ("The Elegant Skull") as a parody of a Mexican upper-class female. Posada's intent with the image was to ridicule the others that would claim the cultural of the Europeans over the culture of the indigenous people. The image was a skeleton with a big floppy hat that decorated with 2 big feathers and multiple flowers on the hop of the hat. 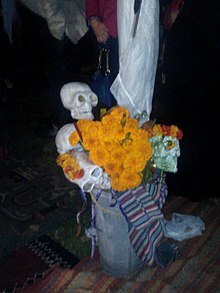 Posada's striking image of a costumed female with a skeleton face has become associated with the Day of the Dead, and Catrina figures often are a prominent part of modern Day of the Dead observances. A common symbol of the holiday is the skull (in Spanish calavera), which celebrants represent in masks, called calacas (colloquial term for skeleton), and foods such as sugar or chocolate skulls, which are inscribed with the name of the recipient on the forehead. Sugar skulls can be given as gifts to both the living and the dead. Other holiday foods include pan de muerto, a sweet egg bread made in various shapes from plain rounds to skulls, often decorated with white frosting to look like twisted bones. ^ a b Brandes, Stanley (1997). "Sugar, Colonialism, and Death: On the Origins of Mexico's Day of the Dead". Comparative Studies in Society and History. 39 (2): 270. ISSN 0010-4175. ^ a b c Marchi, Regina M (2009). Day of the Dead in the USA : The Migration and Transformation of a Cultural Phenomenon. New Brunswick: Rutgers University Press. 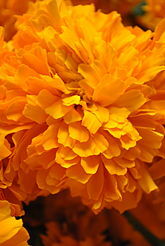 p. 27. ISBN 978-0-8135-4557-8.